The severe winter weather is costing the economy of Devon and Cornwall between £10m and £15m a day, according to a regional business organisation. 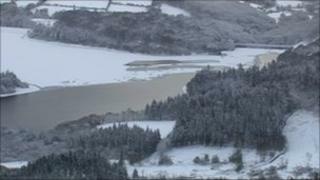 The Devon and Cornwall Business Council said the figure was based on "detailed calculations" made after snowfalls last winter. The region's hoteliers are experiencing high numbers of cancelled bookings, because guests are unable to travel. The council said it suspected the lost business would never be "caught-up". Tim Jones, the business council's chairman, said: "This is the time of year when visitors would be coming down for holiday- making. "They've delayed those trips and we suspect we're never going to catch-up that business." Duchy Hotels runs three hotels in Torbay, which is a popular destination for pensioners on so-called "Turkey and Tinsel" tours. Their hotels were fully booked for Christmas but have now lost 25% of their bookings. Stephen Furness, from the firm, told BBC News: "Yesterday the phone was ringing, but only for cancellations. "One of our hotels had a whole coach of 50 people cancel. "We can't charge them because of customer relations." The situation is similar at some of the region's pubs and restaurants. Michelle Tessier, landlady of the Golden Lion in Tipton St John, east Devon, said: "It's been a really, really bad month. We just haven't seen our normal Christmas trade. "We're in our peak two weeks leading up to Christmas and it's just dire. "We were supposed to have over 50 booked on Saturday night and we had 13, for Sunday lunch we had nine instead of 50 or 60 and on Monday they all cancelled. "I don't know how long we can last for to be honest." But for some local retailers the snow has boosted business. Alita Pace, who runs the shop in Tipton St John, said she was doing "very well" because people had been unable to leave the village: "It's been great, people who don't normally come in have done." She said customers were bulk buying bread, cheese, baked beans and cigarettes, and she was having to ration the milk supply because she was "running out".